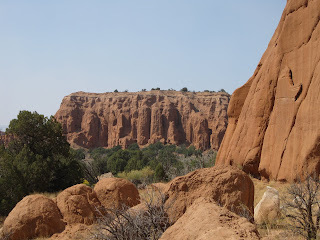 About 30 miles from Escalante, along the spectacularly scenic highway 12 that climbs over and around amazing Navajo sandstone, is the tiny town of Boulder. 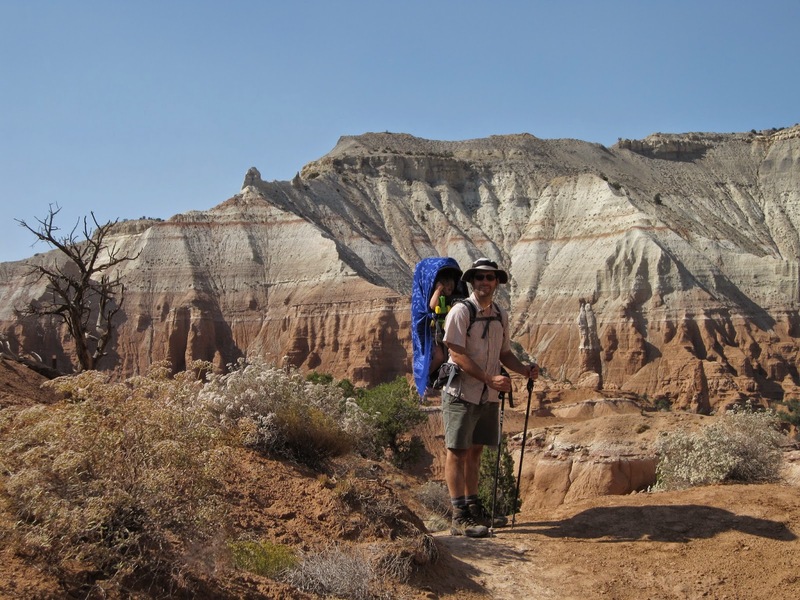 From Boulder, the Burr Trail heads off to the west towards Capitol Reef National Park. 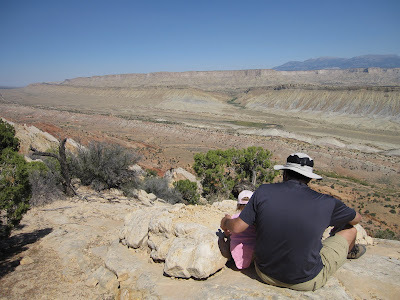 The Burr Trail is a paved route that for 30 spectacular miles heads into narrow red rock slot canyons, down a staircase of rock formations, and eventually down the Burr Trail Switchbacks that somehow descends nearly 2000 feet down to the valley below the waterpocket fold. But, just before you head down those switchbacks, there is a rough dirt road heading north into the Upper Muley Twist Canyon. 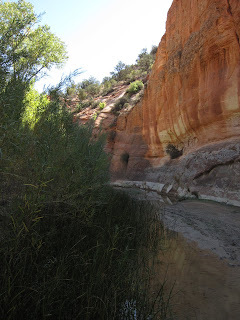 For the next 3 miles, the road literally is the stream bed as it enters a slot canyon. It is a rough road only suitable to high clearance 4x4 vehicles. Despite the thoughts to stop several times, we continued to the end, where the Strike Valley Overlook Trail is. 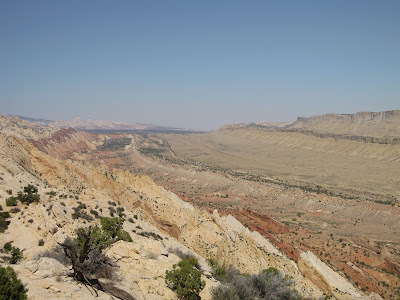 This trail is an easy 1/2 mile climb to the top of the Waterpocket Fold and to one of the most spectacular views I have ever seen in my life. 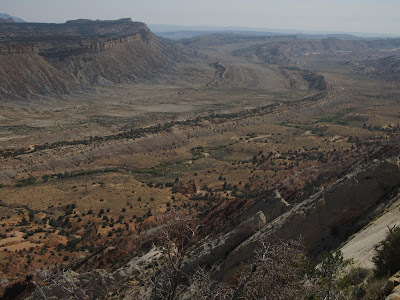 The Waterpocket Fold is a 100-mile fault-block launched 2000 feet into the air. Across the valley, the layers remain horizontal. But, on the fold themselves, they are strongly tilted upwards. 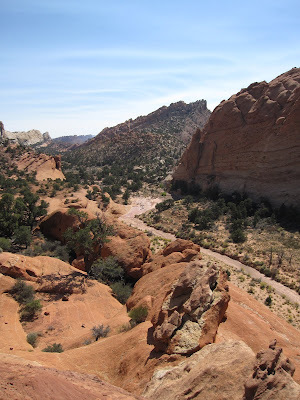 While the resistant Navajo sandstone and other layers remain high up above, the weaker siltstones and clays below that were exposed eroded away, leaving a deep valley. It is somewhat ironic that what you are looking at far below should actually be ON TOP of what you are standing on. 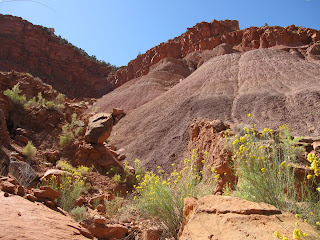 But, those layers eroded away as they were exposed to the elements. Across the valley are the 11,500 foot Henry Mountains, which are laccolith volcanic remnants. These mountains were literally the last place in the continental United States to ever be mapped! What a site to behold! 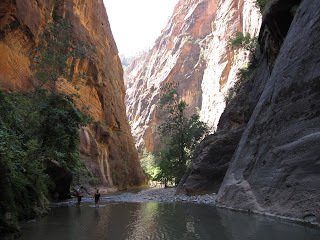 After that hike, we then did a little excursion up the canyon to have lunch and check out the sites. 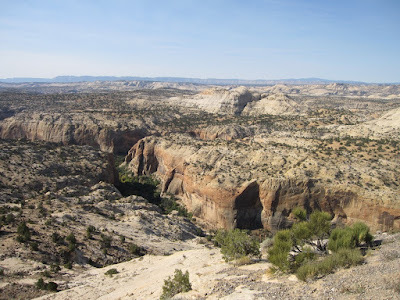 After a week in Kanab and with temperatures expected to rise over the weekend, we decided to roll up north to the Escalante District for the week to explore some areas we never got a chance to do in our time at Page due to the distance. 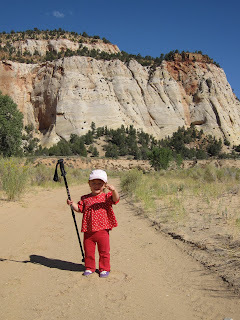 So, we packed up the trailer and we drove the 3+ hours to Escalante, we made a stop at Kodachrome Basin State Park, in the Bryce Valley southeast of Bryce Canyon NP. 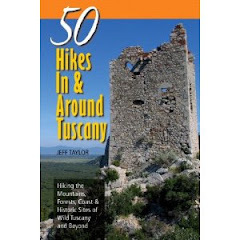 It was pretty hot, but we did a couple of short hikes to see the area. 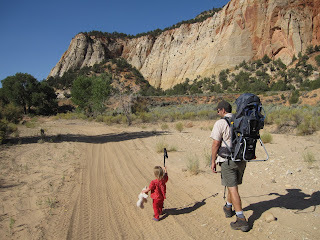 After this stop, we continued onto the spectacular Escalante, UT. We'll talk about this in the next post. Just a preview, how about one of the largest fault-block in the world? 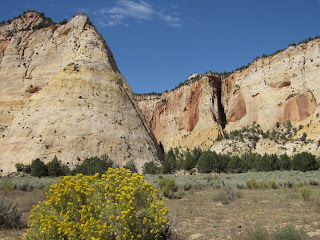 Just south of the intersection of US-89 and UT-9 at Mount Carmel Junction, where the turn to Zion National Park is from the east side, there is a significant, yet unsigned dirt road that branches off to the west. 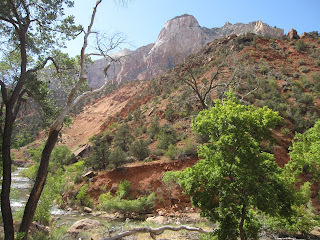 When we lived in the area and drove to Zion a dozen times, we often would look at that road and wonder where it went. So, on Sunday, we decided once and for all to check it out. The road starts out in very good shape as it enters a wide canyon. As the road approaches a farm house, it takes a sharp left and goes around the property. Shortly thereafter, the road narrows to a sandy ATV track that crosses the shallow river several times. We have a 4x4 F150 and did not have any difficulty continuing down this ATV track, as it is wide enough for the most part. Basically, we just drove down the road until we found some nice cottonwoods to park in the shade under. Anyways, from where we parked, we just started walking down this beautiful valley along the ATV track. This track also made for a very easy trail for Hilina to follow on the soft sandy substrate. We did not encounter a single vehicle the entire day, but that does not mean you won't. So, just be prepared to potentially have your beautiful canyon silence broken by the roar of weekend riders. The track basically criss-crosses the river over and over. At the time we were there, hardly any water was in the creek, but I suspect after rains it could be higher. The beautiful White Cliffs rise above to the north and nice forested side canyons head off to the south. 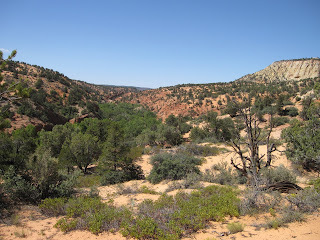 We walked this beautiful canyon until reaching the point where the ATV track climbs at tall pink sand dune. 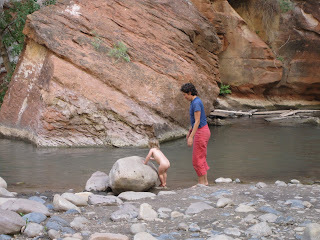 We climbed up onto the red cliffs for a view downstream. 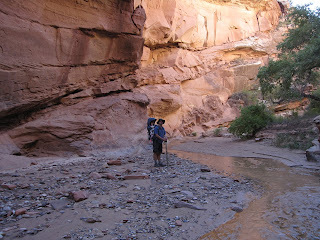 Later, we found out that that is where the real adventure begins as you essentially have to walk in the river downstream as it takes you to some beautiful slot canyons. 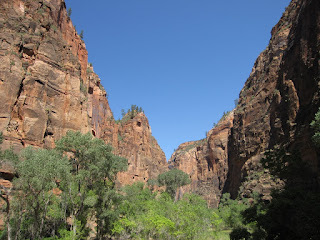 Eventually the route enters Zion National Park, where it becomes a Natural Research Area, which is closed to the public. We definitely plan on doing that another day. 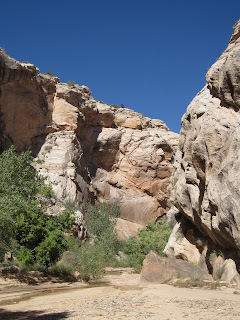 But, for this day, we enjoyed the quiet solitude of a beautiful sandstone canyon! 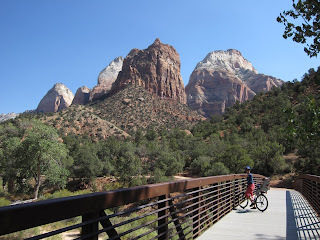 Today, on our first full day back in canyon country, we decided to do something we have never done before and that is bike the length of Zion Canyon. 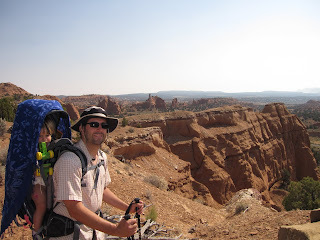 We drove up from Kanab and when we got to the visitor center, the parking lot was completely full. We were forced to park outside the park and pay $10. We unloaded the bikes, hooked up Hilina's bike seat, and away we went. 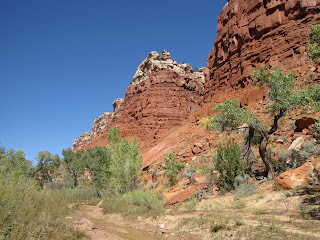 We cruised up the Pa'rus Trail to Canyon Junction. 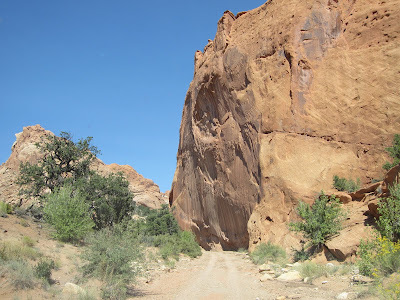 But, as we went onto the road, we soon realized that it would be an uphill climb the entire way to the end of the canyon. It makes sense given we were heading upstream along the Virgin River. This wasn't steep, it was just steadily climbing and taking more effort in the heat than we were wanting. 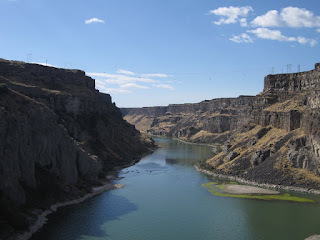 The first section is probably the worst climb since it crosses the old landslide that dammed the river 200 feet deep until the river over-topped it and ate a route through it. The good news is that since the canyon is closed to vehicular traffic and only the park shuttles run on the road, it is a relaxing bike ride without the traffic. 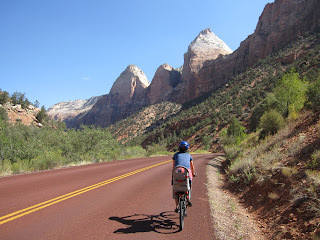 Well, upon reaching the first shuttle stop at Court of the Patriarchs, we decided to load our bikes onto the shuttle, ride it to the end of the road, and then let gravity help us on the return. That ended up being a very wise decision. 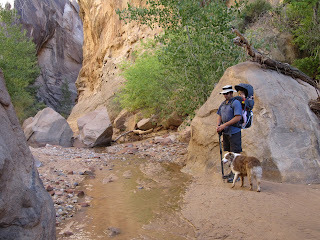 From the end of the road, we hiked one more mile to the Virgin Narrows. Here, Hilina got stripped down and went in to play in the cool waters. 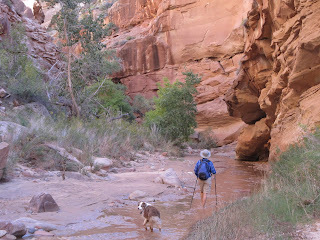 While Linda watched Hilina, I proceeded to hike upstream into the gorge. 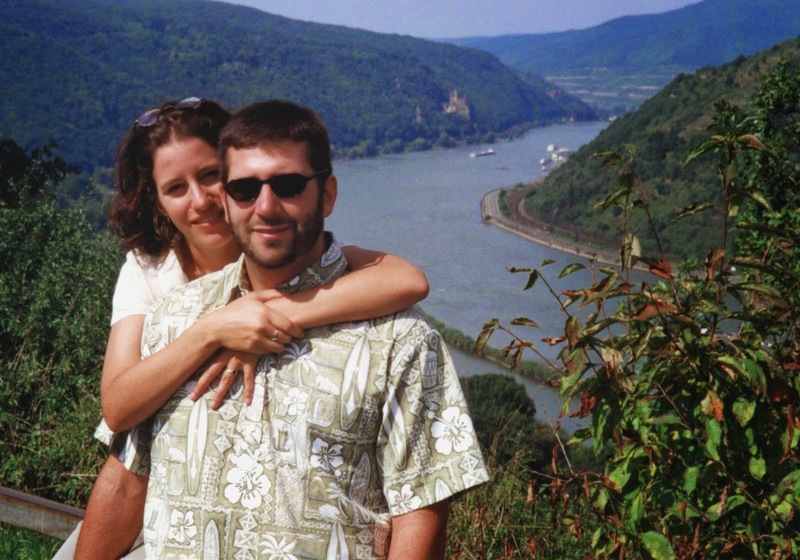 I did not make it very far before a section of stomach-high water stopped me. It was not that I was afraid to cross this 20 foot section, but I just did not feel like riding back in wet underwear. Many others proceeded further up the river. 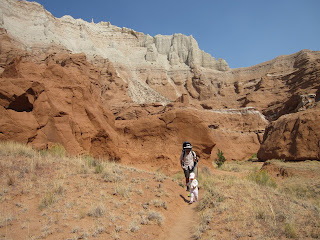 After ample play time, we hiked back to our bikes and cruised effortlessly back down the road to the visitor center. 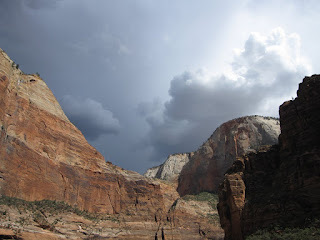 An ominous looking storm formed in the mountains to the north and we head some thunder, but we did not get rained on. However, those are conditions to get out of the narrows in, because of the danger of flash floods forming miles up river. What a great first day back in canyon country! 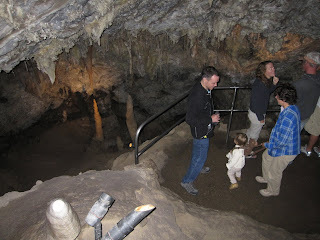 Next we traveled down to Timpanogos Cave National Monument in the Wasatch Front range. Just south of Salt Lake City, this cave system is unique due to being a fault cave. 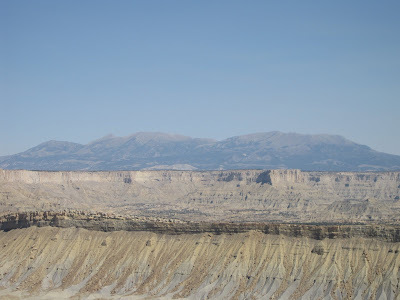 It was formed when a fault on the mountain moved, creating a large crack in the mountain that allowed rainwater to flow down and deposit calcite formations. It is also home to some really unique formations I have never seen in any other caves before including, helictites which resemble soda straws but curl around in all directions like curly fries. 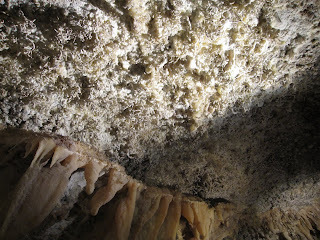 We were told that Timpanogos Cave has one of the largest collection of these formations in the world. To get to the cave requires a 1.5 mile hike that climbs 1000 feet through stands of white fir and canyon maple. 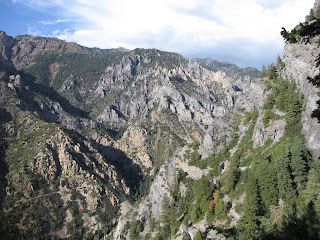 It is located up the beautiful American Fork Canyon, which gives a great peak at the geology of the Wasatch Front Range. 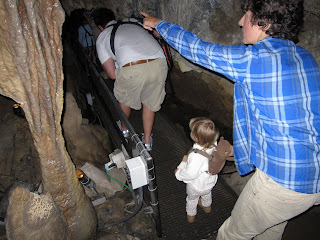 The cave tour is lead by National Park Rangers and lasts about 1 hour. Hilina loves caves and was having a blast inside. But, the boring park ranger kept going "blah blah blah" and stopping us while Hilina wanted to continue. Linda had her hands full. At one point, the ranger was talking and Hilina blurted out "No No No". 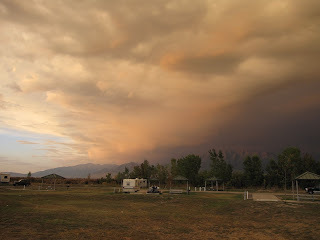 That night we camped at Utah Lake State Park near Provo. Utah Lake is another, albeit smaller, remnant of Lake Bonneville. However, due to the inflow of freshwater from the mountains and an outlet has remained mostly fresh, as compared to the Great Salt Lake. The Great Salt Lake is so salty because evaporation greatly outpaces inflow and there is no outlet for it. Thus, any salts that flow into the basin remains in that basin and has been accumulating for over 20,000 years. As evening approached, a vicious looking storm formed over the Wasatch Front and looked like it might come over us. However, it eventually broke up and we never saw any rain. From Utah Lake, we then made the 5 hour run to Kanab, which will be our home base for the next month. On the next post, I will tell you about our lovely adventures at Crazy Horse RV park and why we are paying more to stay at Hitch-N-Post RV Park instead. 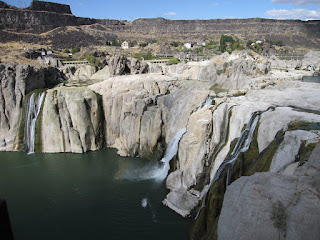 Then it was onto Twin Falls and the spectacular 200 foot cliffs of Shoshone Falls in the Snake River Canyon. This is the end of the historic salmon migration, as they could not possibly ascend those falls. In fact, those falls create a biogeographic separation between Pacific oriented fish species such as salmon, rainbow trout, sturgeon, and others and those with Rocky Mountain/Great Basin affinities such as Bonneville cutthroat trout. Only whe n flood waters created temporary lakes in the canyon were fish able to pass this barrier. 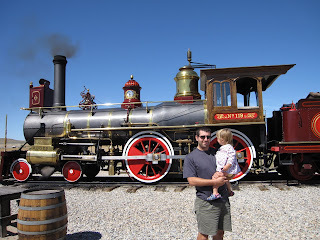 After a night at the nice little county campground of Rock Creek Park, we headed south into Northern Utah to Golden Spike National Historic Site, where the Union Pacific and Southern Pacific railways finally met from east and west. They had two circa 1960’s replica steam engines on display and did demonstration runs with them. Hilina was in heaven, as they went by and she waived her little Thomas the Tank Engine toy at the conductor. 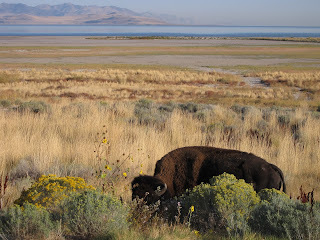 That night we camped at Antelope Island State Park in the middle of the Great Salt Lake, the last remnant of the ancient Lake Bonneville that once covered over half of Utah. It is a beautiful grassland full of proghorns, bison, and coyotes yelping at dusk. We had pronghorns running right by the campsite. 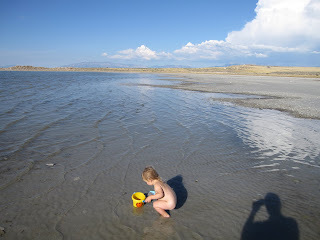 We went for a quick swim in the warm Great Salt Lake, which due to its extreme salinity that is some 4-8 times saltier than the ocean, makes you extremely bouyant. I also discovered that the flat oolitic rocks on the shore are some of the most amazing skipping rocks I have ever seen. The extra heavy salt waters, in combination with the light, flat rocks, makes for rocks that seem to float across the surface until all momentum is lost. So, what is oolitic rock? 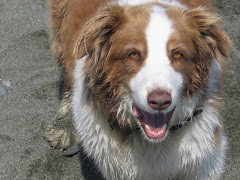 It is sand that has been glued together with calcium carbonate, sodium chloride, and brine shrimp excrement into layer rocks. They are fairly soft and pretty easily to break apart. You can tell they will become (or already are) layers of sedimentary rock that future geologists will study.